From left are Stephen Huff, Emily Huff, Gina Hollenbeck, Christine Lovly, MD, PhD, Amanda Nerstad and Gary Nerstad. 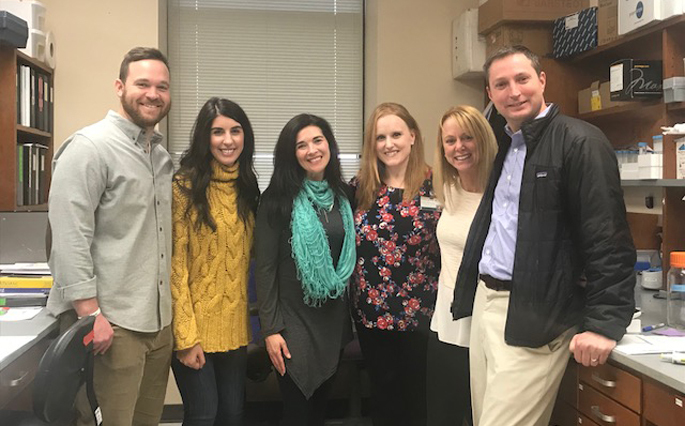 A group of young lung cancer patients and their family members recently toured research laboratories at Vanderbilt University Medical Center and Vanderbilt-Ingram Cancer Center (VICC) to learn how investigators are working to find better therapies and possibly a cure for the disease. Amanda Nerstad and her husband, Gary, of Knoxville, Tennessee, helped spearhead the trip. Amanda was 39 when she was diagnosed with Stage 4 lung cancer in September 2016. The mother of two young girls was devastated by the news of her advanced cancer. “I’m a nonsmoker and lived a relatively healthy life, and this was a complete shock for us. We’ve realized anyone with lungs can get lung cancer and 433 people die every day of lung cancer,” Nerstad said. Genetic testing revealed that Amanda’s tumor contains an abnormality in the gene encoding the anaplastic lymphoma kinase (ALK). Such genetic alterations in ALK are detected in up to 8 percent of all non-small cell lung cancers and appear to be more common in younger patients, such as Nerstad. There are several FDA-approved drugs which specifically target the aberrant ALK within the lung cancer. Nerstad and her husband reached out online and joined a group called “ALK Positive,” which consists of more than 1,000 patients and caregivers in 41 countries who together have raised $400,000 since September 2017. In partnership with the LUNGevity Foundation, the ALK Positives recently awarded two research grants to help investigators search for a cure and assist those living with ALK. The couple also has been active with other lung cancer awareness events. In November 2017, Nerstad and her husband attended and blew the horn to kick off the LUNGevity foundation’s fundraising walk/run in Nashville, with the goal of raising awareness about patients suffering from lung cancer. They also operated a lemonade stand to raise funds for ALK Positive Outreach. During the event the couple met several members of the VICC community, including Christine Lovly, MD, PhD, assistant professor of Medicine. Lovly studies ALK+ lung cancer and has received several grants to promote this research. “The remarkable thing about Amanda and the other patients in the ALK Positive Outreach group is that they met through social media, organized themselves and really tried to support and provide a community for one another as they are going through similar diagnoses. They also are doing a tremendous job in bringing the patients’ voices to the research arena,” Lovly said. Amanda and Gary Nerstad, along with Stephen and Emily Huff and Gina Hollenbeck, visited VUMC and VICC for a behind-the-scenes tour of how cancer research is conducted. They got a firsthand look at lung cancer research projects in Lovly’s lab. “In my lab, we looked at ALK+ lung tumor cells in culture and talked about how we grow the cells, what happens when a patient’s tissue sample comes to the lab, what kinds of things we can do with it to study the tumor on an individual level, and basically introduced them to what a lab looks like,” Lovly said. Lovly introduced some of the other investigators who are doing work at the laboratory bench. The group visited VUMC’s Translational Pathology Shared Resource (TPSR), led by Kelli Boyd, PhD, professor of Pathology, Microbiology and Immunology, who showed the patients how scientists process lung tissue, then embed and make images of the tissue. During a tour of the High-Throughput Screening (HTS) Core, Joshua Bauer, PhD, research assistant professor of Biochemistry, revealed how researchers use sophisticated chemical libraries and robotics to do high-throughput drug screening on tumor cell lines. Nerstad called the visit to the VUMC and VICC facilities “an amazing experience.” She was especially impressed by the pictures of other patients with rare types of lung cancer that Lovly has displayed on the office walls to remind her of the patients she’s trying to help. The pictures were especially poignant for Nerstad. While one of the FDA-approved therapies for ALK-positive lung cancer is keeping her cancer at bay, she knows that her cancer eventually will become resistant to the therapy and she and other patients still need a cure. They’re more optimistic after meeting investigators like Lovly and her colleagues. “The researchers not only gave us hope for the future, but our visit motivated all of us to continue to raise awareness and help find a cure,” Nerstad said.